Playout is one of the few domains where, at least in some parts of the world, managed service plays a significant role. As such it allows little differentiation, the workflow is relatively standardized and the calculation of the cost base line is quite simple and predictable: equipment + operational staff + space. Service companies have emerged around the world often distributing hundreds of channels each. The competition, the wish to address always smaller local and niche markets has progressively pushed the prices down. Since the cost of equipment is comparable for everyone and the move to lower cost staff countries is neither well accepted nor always technically feasible, Service companies have reacted by streamlining their operations increasing the viewing ratio, regrouping smaller channels in centracasting facilities and investing in channel in a box solutions. In a time of skinny bundles and vanishing thematic channels this is no longer enough. This is how one of the managed service executives described linear playout. As linear TV and especially the pay TV business model is being challenged by On Demand consumption and OTT, the media chronology is also being shacked up. The typical 3 to 5 years SLA based managed service contracts are no longer compatible with the fast-changing rights situation especially for Sports and the necessary agility. Rights owners are looking to monetize their assets with Pop up channels they want to start and shut down fast if necessary. This puts the traditional CAPEX heavy financial model even more at stake. The risk mitigation and the economies of scale provided by managed services are counter balanced by the media groups wish to control the entire the eco system (as Netflix and Amazon) with the ability to differentiate and react quickly without having to negotiate a change request and an SLA. In their own right the larger media groups have the scale, financial, technology and staff resources or acquire them (Disney/Bamtech; Turner/StreamPlanet, Endeavor-IMG/Neulion…). Thanks to dropping connectivity costs, physical location is becoming less of an issue. 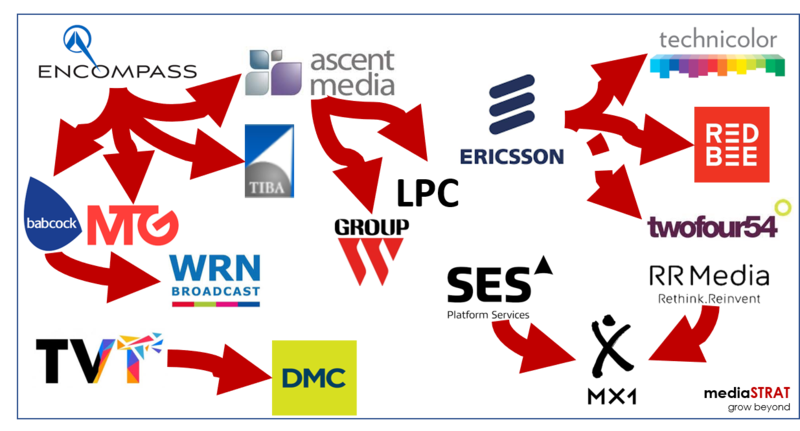 The examples of Sky insourcing its German playout abroad or the centralization of Discovery’s international operations in the US are good evidence of this trend. In the mean time the newer less mature companies like DAZN still heavily rely on managed service. As most global media groups (Disney, Fox, Sony, Warner, Discovery …) have their European headquarters in London and were the ones looking to distribute the most thematic channels an entire eco system emerged to serve that need benefiting from the fact that the UK OFCOM license granted them access to all EU countries. Playout facilities serving hundreds of channels, multilingual staff, media management and post facilities are now at stake. If RedBee and Encompass benefit from interconnected multinational footprint and can offload some part of the work, players with a UK only footprint were at risk. TVT through its acquisition of Amsterdam based DMC was the first to react to mitigate it. Babcock thanks to Encompass despite a very limited continental European presence can reassure its customers that the Brexit will not impact their operations. No question that the often-announced death of linear TV is no were near yet and for many it is still the preferred media consumption mechanism. Having said that non-live content will progressively shift toward nonlinear distribution putting the managed service providers in front of a huge strategic challenge. For the remaining players it is less about developing new services then getting the timing and the pace of change right. The clash of the (media) titans: Where is Europe? previous post: Why Fox spends 29B$ on Sky and Netflix 12B$ on content? next post: Why is hall 14 at IBC a tent?